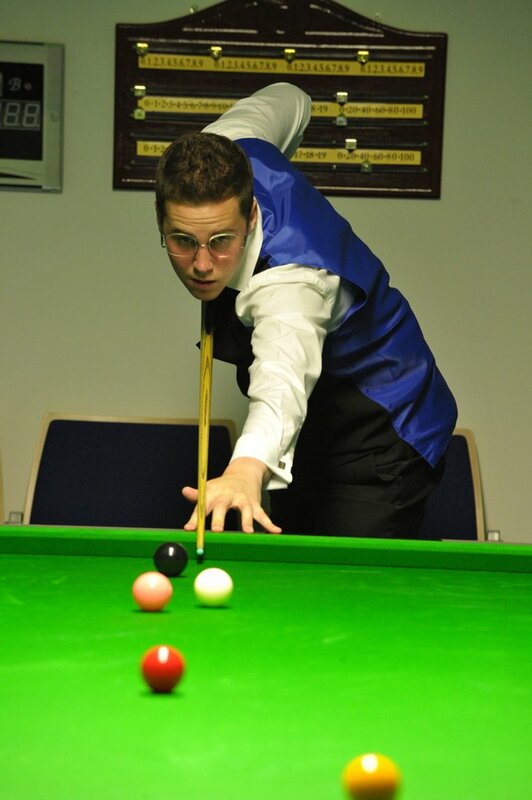 Gareth Allen is a talented 23 year old Welsh amateur snooker player with ambitions to make it onto the main professional snooker tour. 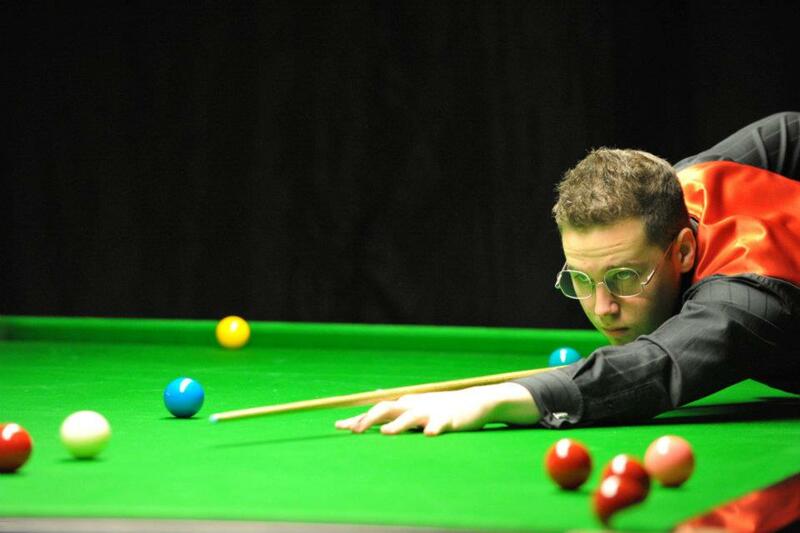 Real life has so far got in the way of his snooker playing ambitions, but with the advent of the PTCs and sponsorship courtesy of Sport Wales he has taken the plunge for a once in a lifetime crack at the big time. I caught up with him at PTC7. Can you tell us a bit about yourself, when you first started playing snooker? I first started playing snooker when I was about 3. My grandad’s played the game for years and I used to go and stay at my nana and grandad’s house when I was young, and he’d have it on the television and I used to get down on the floor and grab a pencil and some marbles and play like that! Then on my 3rd birthday I got a little 4ft table and it’s gone on from there. I went on to 6ft and then eventually when I was 12 I got into a snooker club near me which actually let me in with an adult. I couldn’t get in anywhere before that, so I started playing on a full size when I was 12. You never played on a full size before that? Well a couple of times on holiday in Centre Parcs, but apart from that no. When did you make your first century? I made my first century when I was 16, which was 4 years since I first started on the full size table. I’d made 70 and 80 breaks and I remember 76 was my highest break for about a year when I was 13. My first hundred was in a competition actually, and then I made a few more after that and went on from there. Have you made any 147s? I’ve not made a 147 yet. I’ve been close a couple of times, got to the last red or the colours, one time I snookered myself on the yellow! 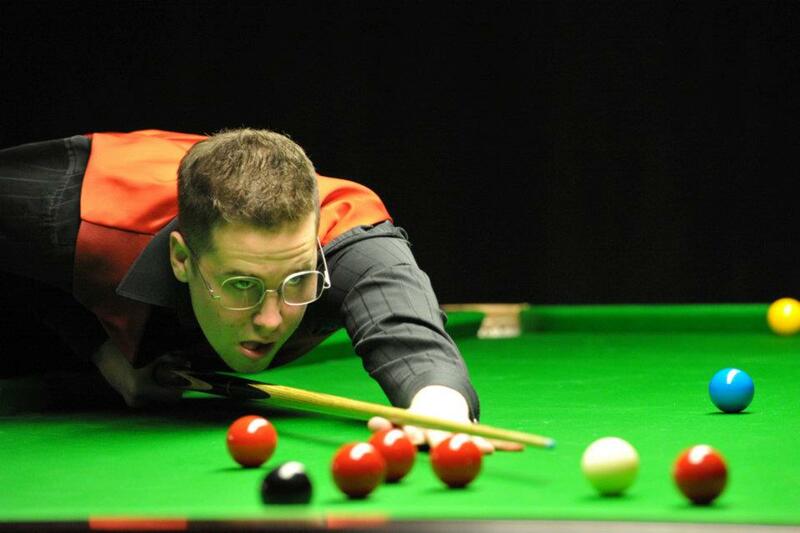 What’s been your snooker career to date? Did you play on the PIOS? I didn’t do the PIOS because I was working full time then and I couldn’t get time off work. It’s only really been since July that I’ve actually reduced my hours of work and gone down to part time so I can give it a good go. I got a table at home 7 years ago and I was practicing when I was in the 6th form but I got a job because I wanted to do IT and I didn’t really know what I wanted to do with snooker. So I did a job and then practiced at night when I got home for maybe 3 hours. I did tournaments, I went down to Coalville a couple of times and played in Malcolm Thorne’s competitions, but it was hard because I couldn’t play full-time. When did you decide to take the plunge and move from full-time to part-time? I was getting pretty fed up with work really, and last year I received sponsorship from the Sports Council for Wales who gave me £3000, and I thought that now I’ve got this money I’ve got to do something with it. How did you get the sponsorship? I finished number 3 in Wales, in the Welsh men’s rankings. That made me eligible to apply for the funding. They tend to give it to the younger people to give them a go rather than the older men who finish at the top, so when I received it I felt I really needed to give it a go. I want to live my life with no regrets and now’s the time to do it. So I’ve gone down to 3 days a week now. Did the PTCs have anything to do with it? Yeah because it’s obviously a chance to play in a competition with all the pros, and it’s good hard match practice, plus the chance of earning some money and getting on the main tour which is where I want to be. Do you have a plan time wise, like giving yourself 3 years? Yes I’m giving myself 2 to 3 years, because I’ve got this sponsorship for another 2 years, hopefully. OK. The idea was to give up a couple of days at work now, and then practice for two days and then at the weekend instead of going to tournaments do more practice. But as it’s turned out you’ve got the PTCs and I’m always away playing! So I’ve not really had that much chance to practice and also I’m having to work those extra days that I’ve had off, and maybe work a full week so I can have the next week off to go to Poland or Germany. Has your game come on with the match practice? Yeah I feel I’m a bit more confident in matches and there’s some good international players and I feel like I’m competing and I’m doing alright and have won a few matches. I’ve not beaten any names yet but in Poland I went 3-1 up against Mark Davis and there was big pressure on this match because obviously he’s competing for a top 16 spot against Martin Gould. I was speaking to Gouldy before the match and he said “Come on do me a favour because I’ve lost!” so there was no pressure there! So I’ve gone 2-0 up then 2-1 and 3-1 but I’ve got this horrendous cold I’ve picked up from the plane and my head is in shreds; headache, nose streaming, so I’m there with a tissue up my nose at 3-1 sitting in my chair thinking I feel pretty tired here, I need to dig in now. We had a couple of scrappy frames which he just nicked to go to 3-3 and in the last frame he’s not missed a ball. Have there been any matches that have left you feeling particularly gutted? In Sheffield I played Les Dodd in the first round – he’s in his 50’s now but he’s still a good player. We had a few good close frames but he opened up the match with a fluke and knocked in 50, and he finished the match with a horrendous fluke on the blue! He looked at me and apologised about 10 times! After the game he said “I’m going now so you can slag me off!” and I told him not to worry about it, then later on Facebook and he put some nice encouraging words about me saying that he liked my attitude and that I didn’t lose my head which helped with the plus side of things to take from the game. I get told I’m a feel player. I don’t think about things. Some players are quite methodical, always checking their cue action, looking at the floor making sure their feet are in the right place but I just play on instinct. Do you practice on a Star table? I’ve got a Riley Aristocrat at home which is what they used to play on before the Star’s came in. So I’m used to how the pockets are. How do the pockets compare? Well they’re very nippy on the Star tables but the middles on my Aristocrat are apparently the tightest middle pockets than anyone has ever played on. Even I’m scared of my own middle pockets! The corners are about the same. Who do you practice with? Where I live I’ve not got too many players to practice with to be honest. I’ve got Alex (Taubman) nearby and there’s a guy Neil Jones who’s played in a couple of PTCs and used to be in the PIOS and was a pro for bit, and Gary Peters who used to be a pro years ago and he’s a very good player, you can learn a lot from him. Ricky Walden is only down the road but I haven’t played him that much because of the day job, and with pros that is their day job so they don’t tend to be about in the evenings when I’m playing. I’ll be starting to play him more now though with going part time, and Andrew Higginson as well. Also you’ve got Allan Taylor, another amateur and I’m going to try and arrange a game with Justin Astley. Some players are quite methodical, always checking their cue action, looking at the floor making sure their feet are in the right place but I just play on instinct. Do you learn from watching the top players on tv? I think I should watch them more than I do. I get a bit bored watching because I’m always practicing and playing in tournaments so the last thing I want to be doing when getting home after playing 6 hours is watching it! If it’s on I’ll probably sit there and watch but I won’t be really focussed on it. Do you make an exception for the World Championships? Possibly I’ll watch a few games. I mean the final obviously I’ll sit and watch the final session. Not even all the way through? Not all the way through, I prefer to put a few hours in myself on the practice table and then go back and watch some highlights. Did you watch when you were a kid? Do you have any favourites? Obviously you’ve got to like Ronnie and the way he plays. The guy’s just a genius and if his head was there he’d have been a lot more successful than he has, which is the only thing that has let him down really. But his style of play is just incredible isn’t it? When I was young I used to look up to Stephen Hendry and I used to have the same hair as him just to try and be like him! What do you think is your best chance of getting on tour, do you think it’s the PTCs or Q School or is there something else? No I think my best chance is through the Welsh Senior rankings. When I finished 3rd that time a couple of years ago I was one place off turning pro. Jamie Jones at that time was number one but he’d already got in off the PIOS so it went down to number two who was (Andrew) Pagett, so that’s how he got on the tour. He stayed on that year and then he got to the Worlds the next. How many places are available this time? I’ve just qualified for the first one so I’m in the quarter-finals of that. Do any clash with PTCs? No they’ve all been arranged to accommodate PTCs so that’s good because I don’t have to decide which one to choose. If it came to it I’d probably have to choose the Welsh but if you’ve paid to enter the PTC I think you have to provide a doctor’s note so it’s tough getting around that. What’s the prize money like? 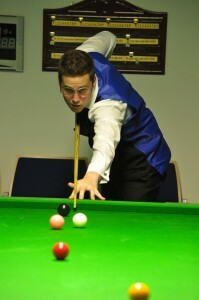 So even though you’re still to get on the main tour you’re pretty much a full time snooker player already! Haha it is like that now yes. I’m part time snooker player part time working but it’s turned out more that I’m in work for 2 days and playing snooker for the rest. How are you finding it to get sponsors other than Sport Wales? Hopefully someone will read this who can help! So you’ve not been on a live stream yet? No I’ve not been on a live stream. Is it something you’re desperate to do so you can be seen by the snooker public? Fellow amateur players such as Sean O’Sullivan and Sanderson Lam have been on Eurosport so the chance is there isn’t it? Exactly. And that’s how you really get noticed isn’t it? One good draw in a PTC and you’re on Eurosport. I thought I might have got the tv table in Poland when I played Mark Davis but they put Bingham on instead. Who would you most like to play on Eurosport in a PTC? It’s got to be John Higgins, Ronnie, Stephen Hendry, people I’ve watched for years and years. Who is the best player you’ve played? Probably Steve Davis in an exhibition. He’s broke off, left me a long red and I’ve knocked it in and made 30 straight away. He’s gone: “You can play a bit can’t you?” and obviously there’s a few in the place that know me so know I can play, and others who don’t so I’m just the guy who turns up there wearing glasses! So I’ve knocked in 30 straight away in front of 200 people and I’d not played in front of that many before, and he knows I can play so starts playing serious. Then he left me a red below the pack which meant I was going into the reds so I had to split the pack open and screw back for the black. At this point I’m maybe 50 ahead and I know if this red goes in I’m going to have 6 or 7 open reds. So I potted the red, went into the pack and screwed back off the cushion and landed perfect on the black and I looked up the table and the pink has dropped in the corner pocket and I’ve left him plumb in the balls! He made 40 odd and with the 6 for the foul he’s pretty much level board and then he went ahead on the colours, I pot a long green, cut the brown in with the rest and I’ve got an awkward cut back on the blue to bottom pocket, I wobble it, he pots it, comes round the table finished perfect on the pink, I was gutted! That was a good experience because he took time to come and talk with me afterwards about what I want to do and he’s a really nice guy. It was a good exhibition because he’s very witty. A guy in the audience was really drunk and every shot was just heckling him, “Bloody rubbish you, go on get off, I want me money back” and all this and every time he said something Steve always had something on the end of his tongue he could roll off to say back to him and the whole of the crowd was laughing. My ambition is to just get on the main tour and give it a crack. I can say I’ve had a go then. ‘That’s not what your wife said last night’ sort of thing. Yeah something like that. Just dead witty and if he’s ever doing an exhibition near you I recommend going. My ambition is to just get on the main tour and give it a crack. I can say I’ve had a go then. If I make it I make it, if I don’t I can say I gave it a go. If I do then great, hopefully I can make a career out of it. It’s all about getting on that main tour. Well good luck with that and I hope it works out for you. You can follow Gareth on Twitter here. This entry was posted on Wednesday, November 2nd, 2011 at 11:50	and is filed under Interviews. You can respond using the forum link above, or by trackback from your own site.